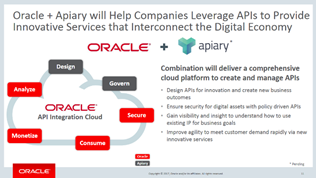 On January 19, 2017, Oracle announced that it signed an agreement to acquire Apiary, which creates the most comprehensive API Integration Cloud by adding the leading API design and governance solution. The proposed transaction is subject to customary closing conditions. Until the transaction closes, each company will continue to operate independently. Together, Oracle and Apiary will help companies thrive in the digital economy by comprehensively managing connectivity complexity and API proliferation. Oracle’s existing API Integration Cloud already enables companies to secure, consume, monetize, and analyze APIs. Apiary provides the front-end solution for designing, creating and governing APIs and the combination will deliver the most complete API creation and management platform in the cloud. Get the detailed presentation here. Get API hands-on trained at the PaaS Partner Community Forum here.